India has two reasons to take an interest in Africa – it’s deeply concerned about China’s forays into the continent’s strategic and economic space, and it’s also mindful that it requires the support of its 54 nations if it is to realize its ambitions to become a permanent member of the U.N. Security Council. 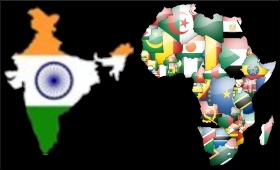 India is a latecomer in Africa, but as a demonstration of its pro-active engagement with the continent, the government this week announced that its trade target with the continent has now been revised upwards to $90 billion by 2015, up from the previous target of $70 billion. The announcement came on March 17, when the India-Africa Business Council met in New Delhi for the first time. The second meeting of India-Africa trade ministers took place the same day. The growing ties between India and African nations has seen bilateral trade soar over the past decade, and India has established a number of pan-African institutions under the umbrella of the India-Africa Forum Summit for capacity building and human resource development across many areas, including the India-Africa Institute of Foreign Trade, the India-Africa Diamond Institute, the India-Africa Institute of Educational Planning and Administration and the India-Africa Civil Aviation Academy. Yet another institution, the India-Africa Business Council, was launched on March 17, with a brief to put in place a vibrant mechanism for enhancing economic and commercial relations between the two sides, especially in areas including agriculture, agro-processing, manufacturing, pharmaceuticals, railways, energy and petroleum and natural gas. As of now, India is in no position to take on China in Africa. But the Indians are clearly making a concerted pitch to win friends and influence people there. Africa the next Great game between India & China? The Diplomat has an interesting article the looks at the growing competition between India and China for Africa’s resources that drive both Asian economies. The reason why the two will zero in on Africa is simple—both have burgeoning, resource hungry populations and rapidly growing economies. If they are to have any chance of sustained competition with developed Western economies, they will need access to the rich natural resources that Africa can provide. China already looks to have a significant edge on its rival, with two-way trade with Africa set to top $100 billion this year, compared to about a third of that between India and Africa last year. Beijing has, after all, been actively courting allies through the Forum on China-Africa Cooperation, which since October 2000 has had regular summits attended by the Chinese premier and dozens of African heads of state. And India’s response was a relative flop. It tried to follow in China’s footsteps by launching the India–Africa Forum Summit. However, at its first and only summit so far, in April 2008, only 14 African countries were represented out of a possible 53. Part of the problem is that India’s External Affairs Ministry is still infused with what’s known in diplomatic circles as ‘Pakistani Syndrome’—an unhealthy focus among Indian diplomats at the highest echelons of government, including the national security advisor, on India’s western neighbour. China’s African ambitions, in contrast, are not hamstrung by such regional concerns. Although the Chinese dragon is surrounded by what it sees as a sea of sharks wanting to curtail its influence in East Asia and the Pacific—namely India, Japan, Russia, the United States and Russia—it has a broad enough worldview and understanding of international relations to continue to focus on the valuable development of Africa. Another Chinese advantage has been that many countries in Africa, including Angola, Ethiopia, Mozambique, Namibia and Sudan, feel a sense of obligation toward China after it helped them when they were confronted with the spectre of civil war following the demise of the Soviet Union. After a surge of attention on the continent during the Cold War, the US and Russia lost interest in spending money in Africa, leaving instability—and space for China to step in. The gaps the two big powers left that China has sought to fill were big ones, with many African nations having depended heavily on their Cold War sponsors in the 1960s and 1970s for state-building assistance after securing independence from their colonial masters. Withdrawal pulled the rug from under any prospects for stability. But China has not just lent financial support to secure goodwill. As parts of Africa were wracked by civil war in the 1990s, China used its leverage as a permanent member of the United Nations Security Council to ensure affected countries received funds and peacekeeping assistance. The assistance was partly payback from China for the debt it owed many countries on the continent for backing the People’s Republic of China efforts to be recognized at the United Nations instead of the Republic of China (Taiwan), a shift that finally occurred in 1971. China received significant backing from African nations who themselves felt they had benefitted from the close, revolutionary ties that Mao had forged in the 1960s. China also, in many Africans’ eyes, acted as an even-handed player, accommodating either the Soviet or US position in a given African country depending on the ‘merits’ of their case. Such ties have given China far better first-hand knowledge of African affairs than India, despite the latter’s closer proximity. But India does have a crucial advantage—its political system is a lot more appealing than China’s. China may be awash with cash to invest, but numerous questions have already been raised about the effects of China’s investment in Africa, with some questioning whether the honeymoon is over. India can capitalize on such reservations by ensuring it contributes robustly to peacekeeping forces in Africa, a move that would be smiled upon by the African Union. Indeed, the African Union shouldn’t be seen as the only worthwhile forum for India to court—the Economic Community for the West African States also has security capabilities that India could support. With both nations competing for resources this should give African nations a better negotiating position, the chance to dictate terms that benefit their nations and also help to grow local economies and attract foreign investment.